This diagram shows the side view of how to build a kitchen or bathroom countertop that has a beveled edge molding attached. 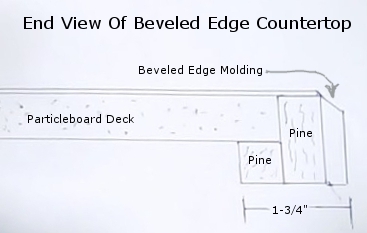 If you are using plywood for the deck you do not need to add the additional piece of pine to the front edge. You can refer to this article on How To Make a Beveled Edge Countertop for step by step video demonstration. We have also included important tips relating to backsplash creation and countertop depths.